The pictures you see here are of recently, as in the last week, filled potholes at the base of speed humps on Marion Avenue in Bremerton. For a long time the potholes here have been a nasty encounter in front of the Frances Haddon Morgan Center. The timing of the fix might be instructive. On Wednesday the Bremerton City Council, acting in its role as the Benefit Transportation District board, met to discuss how to spend the money the city will soon begin getting on Bremerton resident vehicle license tabs. In July residents, Bremerton city residents only, will begin paying $20 a year extra when they go to license their cars or trucks. That money will go to the city’s street fund. The district board will decide each year how to spend it. Wednesday’s meeting was an effort to set priorities before money begins trickling in. Maintenance was the overwhelming choice, which might seem obvious to you, but there were other options that could get some play in the future as well. And by maintenance the focus is on the city’s Pavement Management Index, a scoring system that grades the conditions of a road. Other factors the council considered were how well traveled a road is; cost to repair; proximity to schools, parks and hospitals; whether there is a bus or bike route; the complaint frequency; geographic equity and coordination with other projects. The pavement index was the overwhelming pick, with a preference for roads considered “fair” or better. Roads rated worse than fair will need more than a little maintenance, so much that any TBD money would quickly be exhausted. The second-strongest priority was a scoring system put together by the city’s Public Works department, allowing that city staff will often have the best idea what needs work in town. As part of the conversation Carol Arends, city councilwoman, opened a discussion about potholes. “Every district has potholes,” she said, launching into a description of the ones pictured here. They’re a danger, she said. Other council members knew of this particular set of holes. Jim Orton, streets manager, said his department knew of the problem here and that the site was on the city’s list for fixing. On Sunday I happened to be driving down Marion and noticed the holes Arends complained about had been filled in. I find this very amusing. 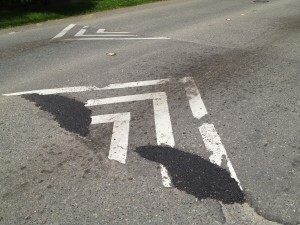 Taxes are spent to improve a road by smooth paving. Then taxes are spent to unimprove it with a big bump that impedes one from going the posted speed and adds wear and tear to vehicles. Then taxes are spent to fix the obstacle which has made the money spent on the original improvement questionable. How long will it take Bremerton to realize that pot holes are just inverted speed bumps and they are free. This reminds me of comedy in the Three Stooges and the Keystone Cops. @ Steven, funny how anytime you (any citizen) mentions a pothole issue to the city, it amazingly is already on the site list for fixing. Has anybody outside of public works ever seen the actual site list of items awaiting attention? I would love to see what is on there. You may report pot holes any time to the Public Works & Utilities dispatch line, 360-473-5920 and leave a message after hours or speak with an employee Monday through Friday, 7:30AM to 4:00PM, excluding holidays. If you call after hours and leave a message, please provide direction (east bound, west bound, etc. ), address of location, and the nearest cross street. I for one am glad to see that the council and public workss are starting to address the pothole issues. I sure wouldn’t want to have Jim Orton’s job at Public Works. He starts each day with the deck stacked against him and does a heck of a good job getting as much done as possible to keep ahead of the hot issues with the limited labor available. A warm thank you to Council Member Arends and Jim Orton. Think you both take a lot of heat and are both doing a great job. 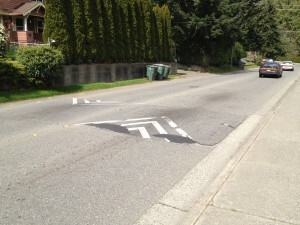 Any pothole is a danger, not just an inverted speedbump. A driver trying to dodge a pothole may hit another car head on, or a pedestrian just walking along the road. Any pothole is a danger to motorcyclist. While I do appreciate the humor in an inverted speedbump, that is really funny, I must point out that potholes are dangerous and imagine they cause much damage to vehicles, including city, state and federal, which we then pay tax dollars to repair.